Below is a summary of the entries of my Grandfather’s World War 2 diary. I’ve listed the more interesting diary entries and/or change of sequence events. For many entries not much happens or is just a daily routine of marching, parades, frustrations, watching movies and writing letters home. He fought in Operation Crusader in Libya in November 1941 and in the Battle of El Alamein in Egypt in June through August 1942. These entries are in bold. Tuesday August 26th 1941 – Sunday August 31st 1941 – German bombs landing so close they used their slit trenches. Aerodrome got bombed ammunition dump was hit. Guards Libyan prisoners. First hint of seeing action. Tuesday October 14th 1941 – Wednesday October 22nd 1941 – water rations cut and sand storm hits. Sees planes heading to Libya. Thursday October 30th – Tuesday November 4th 1941 – on leave in Cairo where he visits a number of sites. He mentions the postcards he purchased – these are likely the ones he bought. Saturday November 22nd – Wednesday November 26th 1941 – starts actively taking part in Operation Crusader near Fort Capuzzo. Helps round-up German and Italian prisoners. Coming under heavy shelling. His brother, Keith, is killed during this time period but my grandfather doesn’t find out until 31st December. Monday December 1st (cont) – Monday December 8th 1941 – still holding positions near Fort Capuzzo, but the mail gets through. Tuesday December 9th – Saturday December 13th 1941 – Retreat from the action. Visit an abandoned German camp where they obtain Cognac. Enemy plane crashes nearby and they advance again towards the enemy. Sunday December 14th – Thursday December 18th 1941 – dogfight overhead, heavy fighting towards Tobruk. News that they may retreat back to Egypt. Wednesday 11th February – Monday 16th February 1942 – crosses the border back into Libya. Hears Singapore has fallen to the Japanese. Wednesday 15th April (cont.) – Saturday 18th April 1942 – arrives in Aleppo, Syria. He visits the ruins and the wolves keep them awake at night. 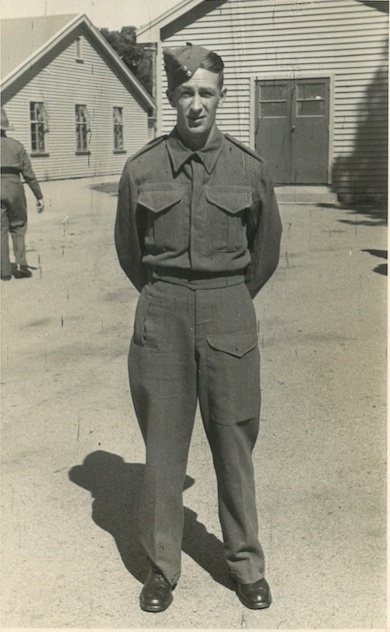 Sunday 19th April – Sunday 26th April 1942 – he mentions the rural farming he sees. Friday 3rd July – Wednesday 8th July 1942 – Attacks German frontlines and is receiving full blast of the artillery 300 yards behind their positions. Ponders chances of survival. To see his photos of Church of the Nativity (Bethlehem, Palestine) click here. To see his photos of Bethlehem, Palestine click here. To see his photos of Jerusalem click here and here. Monday 24th August – Tuesday 1st September 1942 – back to the Convalescent Depot where the days are very monotonous. Tuesday 27th April (cont.) – Friday 30th April 1943 – goes sightseeing in Alexandria and visits Stanley Bay, Pompey’s Pillar and Ras el-Tin Palace. Monday 31st May – Friday 4th June 1943 – rumours continue about returning home by November and some married guards given their return notices. Hospital staff farewelled as they are returning home. This is amazing! Thank you, Paula! I look forward to reading your Grandad’s comments–boring, heart-stopping or not. It doesn’t matter. What a tribute to him and to that generation. Thank you. I feel its my duty to share his experiences with the world. Many of my friends and workmates had family who had very similar experiences so its wonderful being able to share with a wider audience. Some of the entries towards the end of 1941 when he’s fighting in Libya and then again in mid-1942 fighting at El Alamein made me wonder how he ever survived. What a great diary to have. And I can just imagine the work you have done to transcribe it all. Well done. Is there some way I could privately email you please? Thanks for your kind words, I have emailed you. Wow! How wonderful that you have this record. I can see what a challenge reading the handwriting is! My father was an MP in England during WWII and I had an Uncle who was at Normandy. Like your grandfather, neither spoke much about their time during the war. They have both passed away now and I wish that I had something like this diary so that I could get to know them better. Its been an amazing experience and privilege to have these diaries. He likely didn’t expect anyone to ever read them, let alone having them shared with the world 70+ years later. I was lucky to know my grandfather as a child and even as a adult but its still hard to think of the man writing the diaries as the man I remember. Hey, I cant wait to get in and have a read of your new entries since I was here last. well done you.